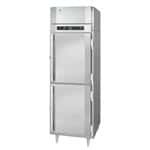 Comercial Dual Temp Refrigerator, Freezer is a must have refrigeration equipment for any restaurant's kitchen with limited space, because it is the universal solution for saving time, money and working space. CKitchen.com offers commercial pass thru dual temp refrigerators & freezers with single and multiple sections from McCall Refrigeration. If you need assistance picking the right commercial refrigerators & freezers, feel free to contact our trained team for help.